High performance “in-line” activated carbon filters for the removal of a wide spectrum of toxic gases and vapours. EMCEL Chemicarb filters have been designed and developed to meet the need for a high efficiency, “in-line” filter for use in applications which involve or produce highly toxic gases and vapours. 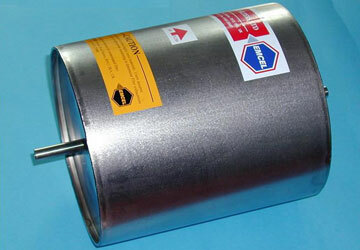 Chemicarb filters comprise a fully welded and leak tested stainless steel cylindrical casing containing a special honeycomb matrix, which creates a swirling gas path within the filter. This feature maximises dwell time for maximum contaminant removal and long filter life. The matrix is filled with activated carbon selected from various grades, including special impregnated types to remove specific gas and vapour contaminants. Particularly suitable for laboratory and small-scale chemical process applications, the Chemicarb filter has been successfully used for the removal of mercury vapour, arsine, phosphine, hydrogen sulphide, acid gases and a wide range of organic contaminants including metallorganic vapours. Contaminant removal efficiencies in excess of 99.9% have been recorded.